This is the sequel to Mario’s Strange Quest. 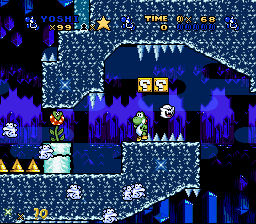 Picking up where Mario’s Strange Quest left off, it turns out that the part where Yoshi’s eggs hatched at the end of MSQ didn’t actually happen. What really happened after Mario beat Bowser, rescued Yoshi’s eggs, and saved the princess was that Yoshi and his sleepy friend decided to move to a new land so that he can protect his eggs from Bowser before they really hatched. 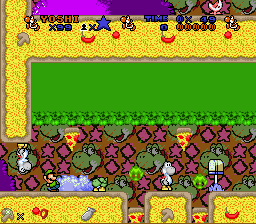 So, both Yoshis do so and they find themselves in the land of Weirdonia. 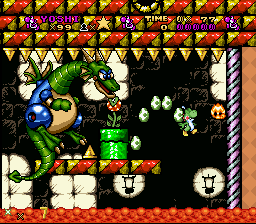 However, it seems that Bowser apparently insists on stealing Yoshi’s eggs, since Yoshi’s eggs were stolen again while Yoshi was out shopping. 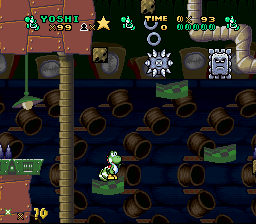 Since Mario isn’t around to help this time, Yoshi goes on a quest by himself to retrieve his eggs. However, just like Mario’s Strange Quest, this isn’t your ordinary quest. The land of Weirdonia is a strange land filled with bizarre gimmicks, weird themes, and possibly jelly filled donuts and pizza. 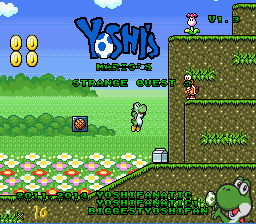 Expect the unexpected during Yoshi’s journey.